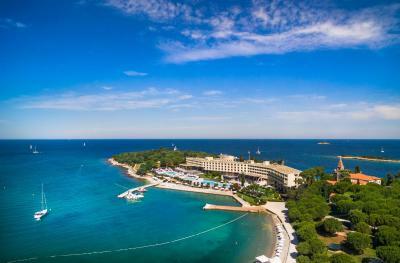 Lock in a great price for Island Hotel Istra – rated 8.7 by recent guests! The location was spectacular! Being on an island was very romantic! The hotel was very luxurious for the price we paid and they upgraded us to an even nicer room than we paid for. Food was delicious and a huge variety. My fiance and I had the best time here! 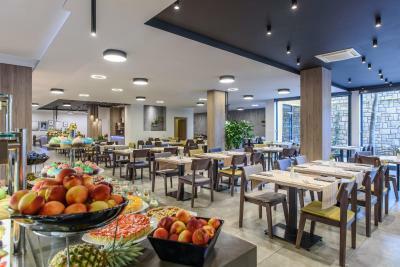 Stunning hotel and island with great food! We have booked our wedding here for 2019 and could not be more thrilled. Service was incredible and the ferry ride in makes it feel so special. 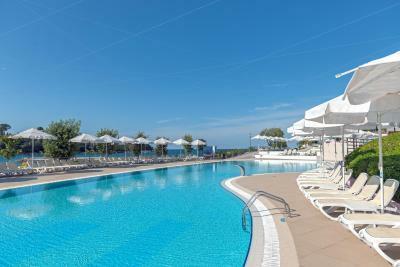 Would recommend to anyone staying in Rovinj! This is not a place I would recommend ESPECIALLY for Croatia. 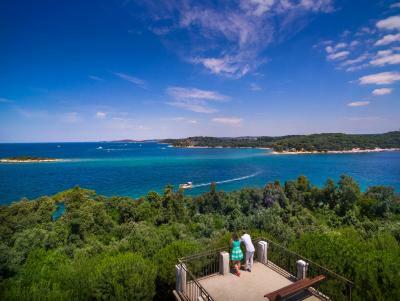 Gorgeous location, privacy, great buffets (breakfast & dinner), lovely walking trails, nice spa (body scrub treatment was excellent); proximity to Rovinj but set amid nature. I liked the location. There were many places to enjoy nature. The trails along the island were very nice. 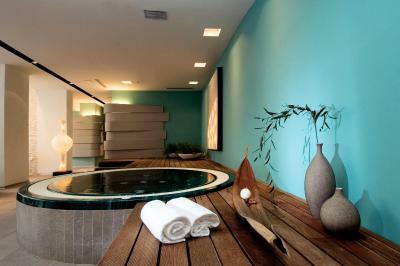 There were so many public places to enjoy and small nooks tucked away if you want some private relaxation. We enjoyed the dinner and breakfast . It was very kid-friendly. Our toddler enjoyed the playground and sandbox. 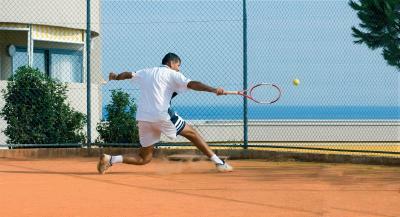 Very nice place, and the staff always ready to serve you. The outdoor area is fabulous! 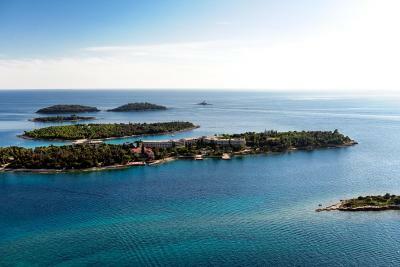 Two whole islands belong to the hotel and offer a wide variety of relaxing spots. The property is beautiful. 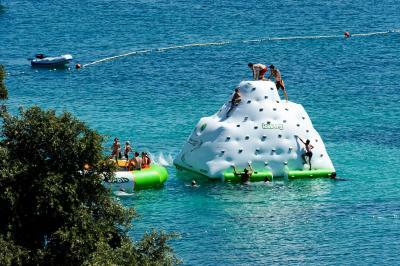 This is a resort so there are daily activities, pools and fully set up for families. 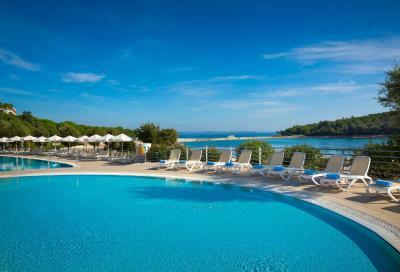 There is room to venture away from the pools and find private areas on the island to enjoy the sun and ocean. It was fun to be on an island but your at the mercy of the ferry schedule. We were able to easily plan our day and work within the hourly departures. Beautiful island and nature. Very hospitality of the staff. Excellent service. 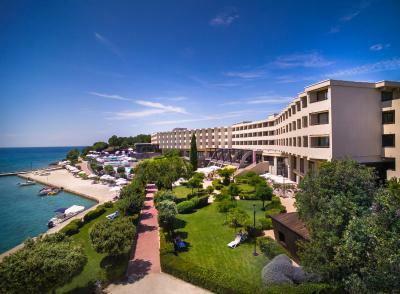 Island Hotel Istra This rating is a reflection of how the property compares to the industry standard when it comes to price, facilities and services available. It's based on a self-evaluation by the property. Use this rating to help choose your stay! Island Hotel Istra, located on St. Andrew's Island, only 150 feet from the clear blue shoreline, features bright and stylish rooms, balconies with sea views and entertainment programs for the entire family. 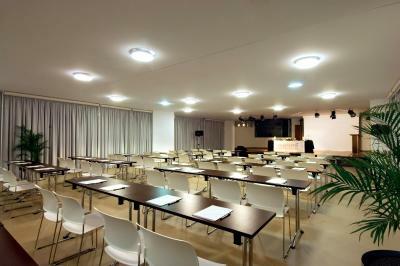 Free WiFi access is available through the property. 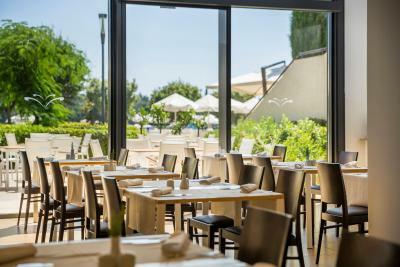 If provides an elegant and sophisticated outdoor terrace, where your can recline and soak up the daytime rays on sun loungers or, after the sun goes down, sit and have a cool beverage in this stylish atmosphere with contemporary lighting. Sun beds and parasols are free of charge. For guests using half-board service, local wines, beer, water and juices from a dispensing machine are included in the dinner offer. 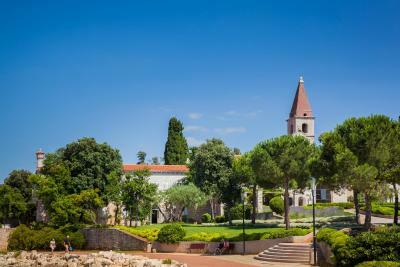 The exciting city of Rovinj is only a 15 minute boat ride away. 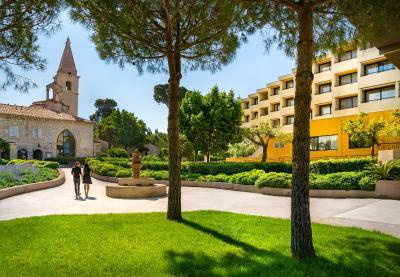 The Istra is famous for its luxury wellness and spa center, the beautiful restaurant in the “Old Castle” and a variety of attractions ideal for leisure travelers and families. Free private parking is available and it is located 2,950 feet from the pier where boats leave for the St. Andrew's Island. Shuttle service from the parking lot to the pier is available free of charge. 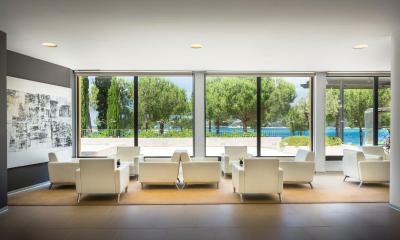 When would you like to stay at Island Hotel Istra? 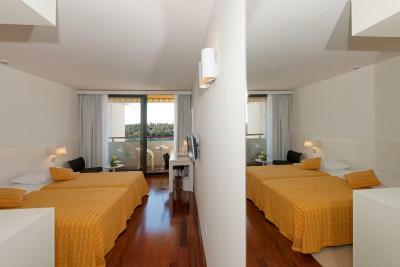 The rooms have 240 ft² to 270 ft² of space and feature a queen bed or 2 twin beds. 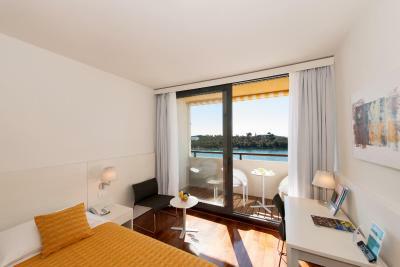 Most of the rooms are facing the seaside. 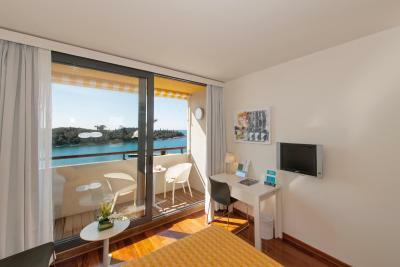 Room features a desk and chair, a balcony and a private bathroom with a shower and hairdryer. 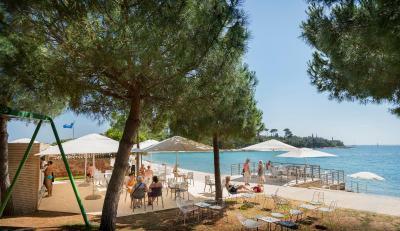 Hotel Istra is an island of its own, a traffic free oasis of sea and sun, private beaches and secluded spots, only a fifteen minute boat ride from Rovinj. 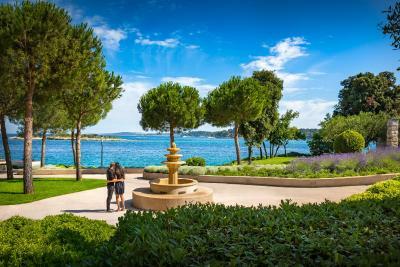 House Rules Island Hotel Istra takes special requests – add in the next step! 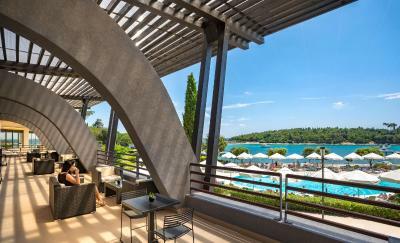 Island Hotel Istra accepts these cards and reserves the right to temporarily hold an amount prior to arrival. Hotel was lovely in a great location. We were booked on a half-board package, didn't realise the restaurant would be heaving with people and in a buffet style. Smell of cigaretts in the room - coming through ventilation. The double bed could be bigger, my wife and I are of average constitution, but we could've used more space. Great and unique island location. 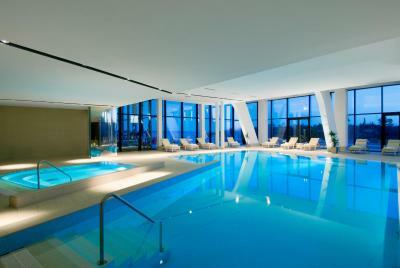 Beautiful rooms with a view, the hotel itslef is great. Nice track for jogging or just walking. The food was also wonderful. Our reserved room was not available when we arrived at 8pm. We had to request an upgrade for a room that we had originally requested. The restaurant was exceedingly expensive. The buffet was wonderful. The pool and island walks were inviting. Loved the frequency of the boats to the mainland. The buffet is outstanding! Definitely great for a family or group. All options for dinner on the island were expensive. The pizzeria was closed. Typical huge resort for rich tourists from Western Europe. 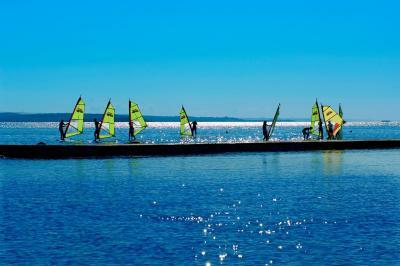 Even though the room rates outside high season are affordable, all other services are ovepriced. 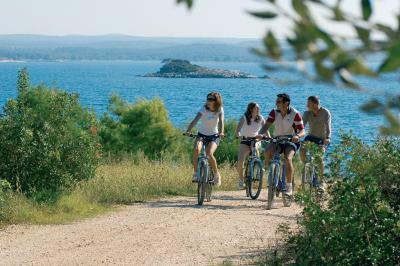 Staff is polite but far from being friendly and smiling which is unfortunately typical for Croatian coast. Choice for breakfast is wide but quality of products (cheese, ham, bread) rather low. Fresh juice extra paid. Bathroom requires renovation. Location is absolutely perfect. Two connected green islands, you can walk, sunbathe or swim whole day. I assume it's worse in high season but the islands were almost deserted in October, very few people and the weather was still very nice. Most guests were elderly people which we liked a lot: no parties, no children, no noise. Boat communication with Rovinj very well organized (cruise every hour, it takes 15 min). 'Artificial' orange juice at breakfast...what is actually standard for such level of hotels in this region. But that is really the only minus. 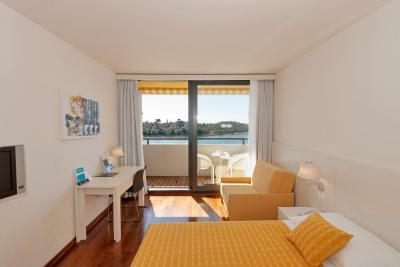 Great location, boat transfer is an added benefit, shuttle to parking is flexible and quick, and really everybody of the staff is friendly and proactive. Great breakfast (with the small exception mentioned above). Our room's air conditioning wasn't working very well. It was cool enough at night that it didn't present itself to be a problem, but during the middle of the summer it would have been pretty uncomfortable. The breakfast and dinner at the hotel restaurant was your pretty basic buffet food. Not terrible by any means, but not anything special and it did get a little repetitive. 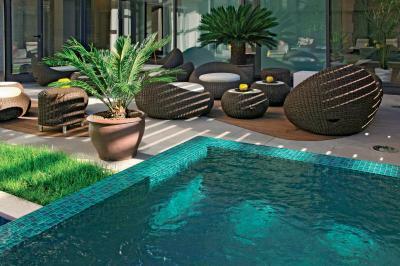 The property was large, clean and had beautiful outdoor areas (both covered and non) and plenty of swimming areas. They provided beach loungers and umbrellas as well. The ferry was easy to use and always on time. The staff were very friendly and helpful. Overall, had a wonderful experience. - The e-mail communication before arrival was not efficient. I had to wait too long to receive the answers of my requests by mail. I think this can be improved.